Yuki-no Kairo or snow corridors can be seen in several places in Japan. In Gunma, you can drive through a snow corridor on the road going up and down the Yamada Toge mountain path over Mt. Kusatsu-Shirane. You can drive approx. 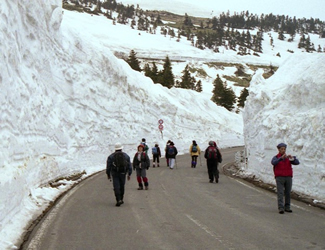 300 meters of the road covered by 10-meter high snow walls on both sides.